As I have become more and more interested in the science and medicine of weight loss I have become more aware of the relationship between us (the consumers) and the food industry. I have become especially aware of how packaging and marketing so subtly and successfully manipulates our subconscious to buy (and eat) more of what they’re pushing. I wanted to take this opportunity to make you aware of some of how the food industry is manipulating your subconscious and controlling your decisions. My goal is to help you make more informed and healthier decisions. The most pervasive method used to control your dollars comes through a manipulation of the human desire to simplify information. People often deal with complex ideas by placing them into oversimplified boxes. In this case, there is so much information about diet, health, and nutrition that people become overwhelmed. In an effort to simplify the complex environment, they then squeeze the information into two boxes: ‘good for you’ or ‘bad for you’. If a person can see something as good then they will rationalize buying and eating more of this item. If a person can see something as bad, they will rationalize buying and eating more things without this item. I will give some illustrations of the schemes the food and marketing industries have come up with to manipulate your decision making. 1. The organic and all-natural mirage. It should be clear how this one works. They claim that their product is “all natural” and since we’ve all been brainwashed to think that if something is “all natural” it is automatically good for us, we think the product is somehow healthier. Just to prove that “all natural” does not automatically equal “good for you”, here’s a list of other things that are also all natural: e.coli, cyanide, polio, cockroaches, snake venom, boogers, elephant dung, and many other ghastly and poisonous things. Even if it was true that “all natural” automatically meant it was better for you, you have no idea whether the claim of “all natural” is factual. More importantly, if you are overweight, the weight is going to kill you long before the “unnatural” substance. All natural, no preservatives, artificial colors or flavors. 2. The reduced fat scam. This is one of my favorites. Fat has long been labeled as ‘bad for you’ in a way that clearly oversimplifies the complexity of its metabolism. Let’s say you’re scanning the shelves and trying to watch what you eat. You happen to be one of those people who eats peanut butter straight from the jar with a spoon. To try and lose some weight, you opt for the reduced fat peanut butter. This way you have less guilt (and maybe a few extra spoonfuls). If you were to look at the nutrition facts you would see the following on the reduced fat jar: Serving Size 2 Tbsp (36g), Calories per serving: 190, Fat: 12g, Carbohydrates: 15g. If you were to look up the nutrition facts on the jar of the creamy version you would see the following: Serving Size 2 Tbsp (36g), Calories per serving: 190, Fat: 16g, Carbohydrates: 8g. What our good friends at Jif pulled was the common trick of taking out the calories from fat and replacing it with an equal number of calories from carbohydrates. You thought you were getting a lighter choice but the calories were the same. Since you had a few extra spoonfuls, you probably were eating more calories in the end. 3. The trans-fat trick. The media went bananas a few years ago on the evils of this type of fat. Trans fats got the label of ‘bad for you’ and were marketed as such. The food industry took advantage of the ensuing hysteria and was able to market their foods as having zero trans fats masking the fact that they are loaded with calories, sugar, salt, and other types of fat. Your subconscious is tricked into thinking these foods are “good for you” leading you to buy and eat more. 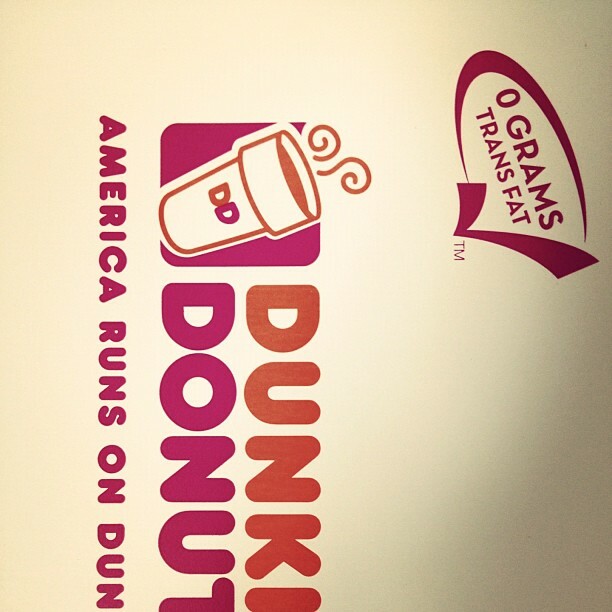 These donuts have no trans fats so they must be healthy, right? 4. The vitamin water and sports drink ruse. I had a patient come into my office asking about ways in which he could lose weight. He was there with his young son and both were obese. Based on my recent post Are You Pouring On the Pounds you can probably guess that my first bit of advice was that he cut out sugared sodas and juices. I was surprised when he told me that he never drank juice or soda. I was about to move on to ask him about his activity level when I remembered him mentioning earlier how he and his son were active in organized sports. I asked him about sports drinks and he said he drank two a day (at 200 calories each)! He fell for the trick that if a super-fit athlete drinks it, it must make you super-fit as well. Adding vitamins doesn’t remove calories. 5. The ‘it’s fruit so it must be good for you’ illusion. 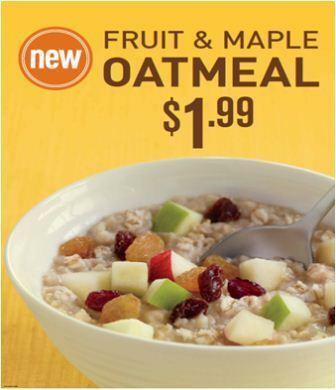 McDonald’s created a breakfast item called Fruit and Maple Oatmeal. The name makes it sound like a more weight loss-friendly choice than a typical Egg McMuffin. It turns out, the choice only saves you 10 calories leaving you a McSucker. I found a really good article that describes how this is particularly a problem for overweight individuals. 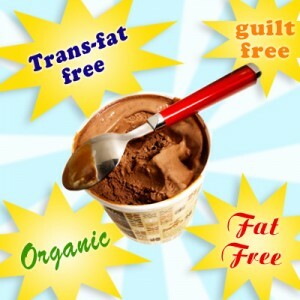 Check it out if you have the time: Dieters Susceptible to Food Marketing Tricks | Business 2 Community. The bottom line is that as long as you are ignorant to how your body works and are unaware of what you are putting in your mouth, you are vulnerable to subconscious manipulation by the food and marketing industries. Do not underestimate the power of their influence over your behavior. They know what they are doing. They don’t make billions of dollars a year doing this for nothing. The good news is that with a little education, you can be safe from their attacks. That is the goal of the WLCR. We strive to empower you through education so you can live a truly long and healthy life. Please tell me examples of manipulative advertising you’ve seen in the comments section below. Dr. Grove – I read something in my social psychology text that was interesting – yet I feel there is more to it than what was written. Elliot Aronson described in his book The Social Animal a scenario where a mom and daughter were picking out cereals. This scenario was supposed to depict an example of the representative heuristic. Basically, the daughter wanted Lucky Charms and the mom wanted her to get Quaker’s 100% Natural Granola. Aronson said that the daughter’s choice was actually better because although Lucky Charms had slightly more sugar, it was more ‘nutritious’. The difference in sugar was negligible. Also, Lucky Charms was lower in calories and saturated fats than Quaker’s 100% Natural Granola. Aronson then went on to describe a study conducted by researchers at Consumer Reports. They gave rats a diet of water and a variety of 32 cereals. The rats grew and remained healthy with the Lucky Charms but Quaker’s 100% Natural Granola actually stunted their growth. “Which cereal for breakfast?” (1981, February). Consumer Reports, pp. 68-75. The example is a bit too oversimplified. Which cereal is more nutritious depends on how you define nutritious and how that one meal fits into your entire days eating. As for the study with the rats, one study generally proves nothing. Even if you believe the study it only is helpful for the obese rats in the world. It may not seem true based on watching our politicians but there are many differences between humans and rats. Can we find a more accurate term for, “food industry”? It seems to me most of the products of the, “food industry”, may have resembled food at one time. But, in the end, the industry has created non-food products. Food-ish industry. It has a certain ring to it. Rhymes with foolish. I sent a letter to Kashi about a year ago telling them I was mad that they used deceptive terms for their “all-natural” GMO food. They never responded and I switched to a real organic alternative. They will say anything to get your green. I think organic and all-natural foods are great, I just want people to understand how various terminology is manipulated by the food industry (and all marketing for that matter) to control our behaviors in a very subversive way. Thanks. What manipulative marketing tricks have you seen on food products? A lot of good info here – thanks!